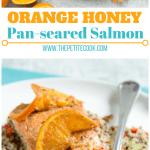 This sweet and tangy Orange Honey Salmon makes a fantastic dairy-free and gluten-free option for a balanced meal, is ridiculously easy to make and packed with awesome flavors and healthy goodness! Since spring season is officially started and the weather is getting warmer, I’ve been craving more and more refreshing meals. And this Orange Honey Salmon is pretty much my favorite dinner lately. It’s super easy and quick to make, loaded with flavours and packed with nutritional value. Totally my kind of meal. 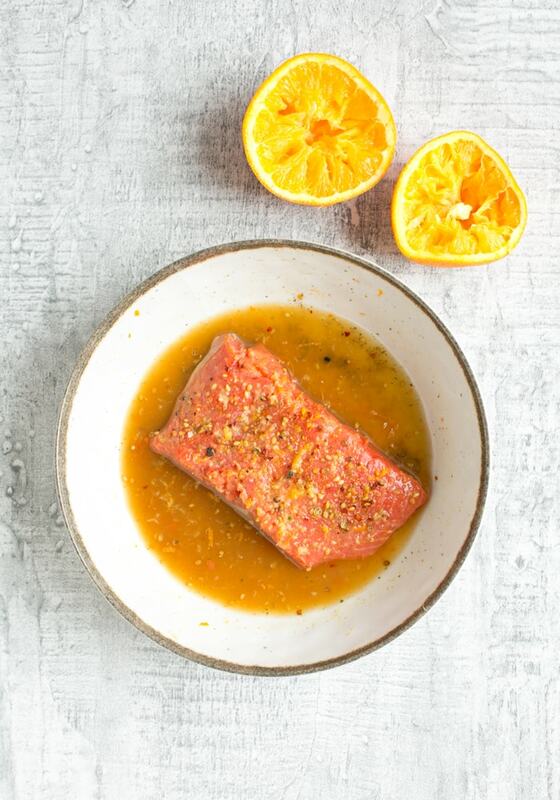 This Orange Honey Salmon is awesomely easy to make, requiring just 15 minutes to make (30 minutes if you include the marinating time) and some simple ingredients, such as responsibly-sourced salmon, orange, honey, garlic, soy sauce (for GF diet, make sure to use GF soy sauce), fresh ginger and few spices. The orange-honey marinade is delicately sweet and tangy, with just the right amount of spiciness. Since most of the marinade ingredients are grated, you don’t really need a long marinating time, the salmon will soak up all the flavors in a blink. It’s totally optional, but I also like to dust my salmon with a pinch of homemade za’atar, an intensely aromatic and ancient spice blend that makes just about any grilled meat/fish taste better. For the fish, I recommend to buy responsibly-sourced salmon from sustainable fisheries whenever possible. Not only does taste better, but it’s environment-friendly and you’ll feel good about eating it. I opt for sustainable wild sockeye salmon whenever available – Just look at the bright pink colour it has, and the fat is almost non-existent. I like to cook this Orange Honey Glazed Salmon over the pan (as the recipe title suggests! ), but you can bake it too. For a quick weeknight meal, I go for the pan-seared option all the way. However, if I have loads of guests coming over for dinner, I like to portion and remove the skin from the salmon beforehand, make individual foil pockets and bake in the oven, so that I don’t have to worry too much about it, and I have it ready to serve with no mess. 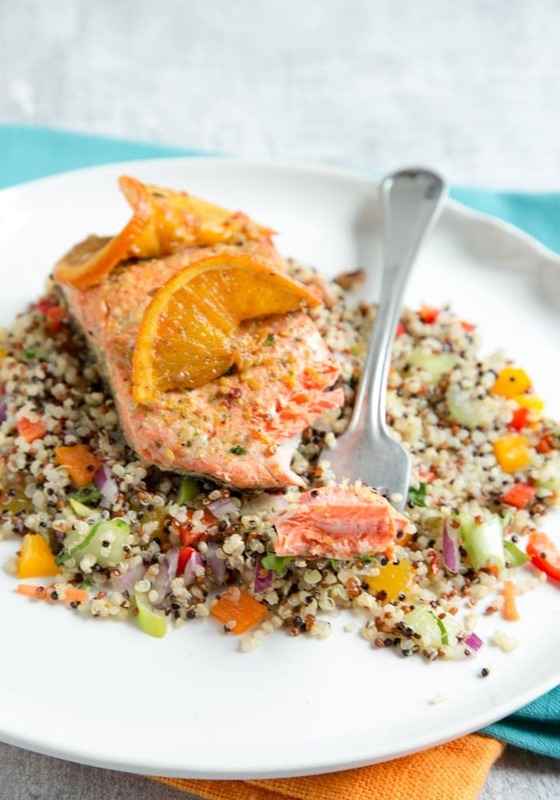 It’s also a great make-ahead dish, simply add all the marinade ingredients in a zip-lock bag (or pasta bowl), place the salmon in and store in the fridge until you’re ready for dinner. 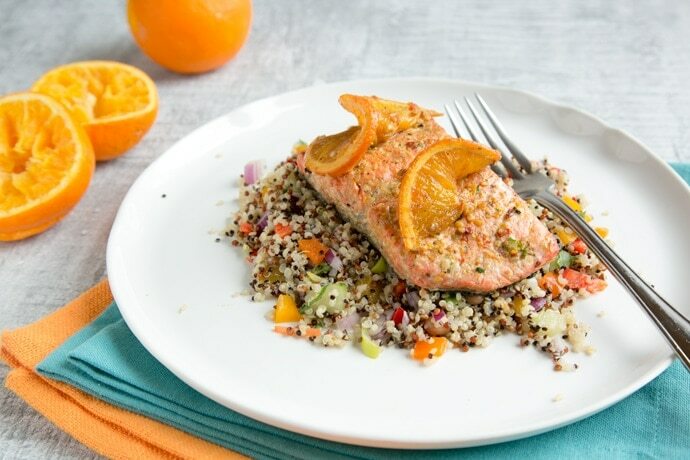 This Honey Orange Salmon is super versatile and naturally dairy-free & gluten-free, you can serve it alone with a simple green salad, but it also pairs super well with an array of different sides and salads. This time I’ve served mine with my energy-packed Quinoa Summer Salad, a simple yet delicious salad loaded with extra nutrients. Easy French Ratatouille: loaded with veggies, this lovely Provençal side makes a great side for pretty much any protein. Pineapple Salsa: give a Mexican twist to your salmon with this vibrant refreshing salsa! 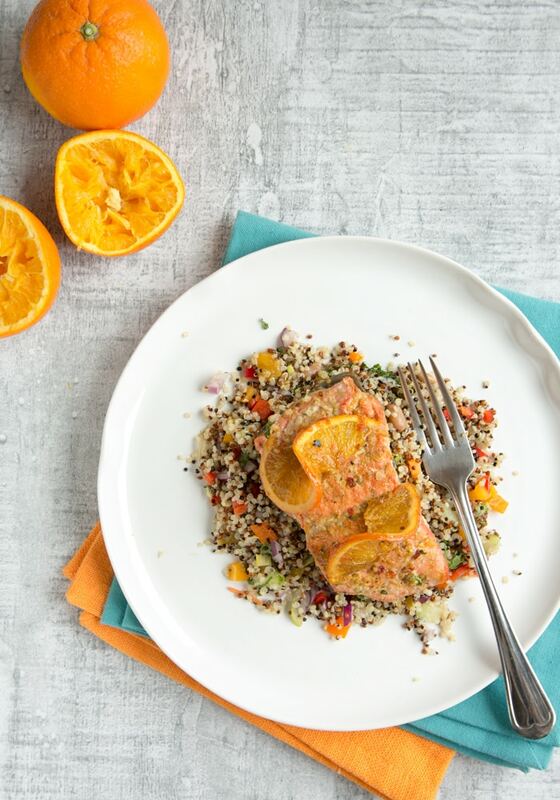 However you serve it, this Orange Honey Salmon is bursting with flavour, loaded with nutrients and simple and quick to make. An incredibly easy recipe to get more superfoods in your body! In a large zip-lock bag, combine all marinade ingredients and mix well. Place the salmon in the bag and seal tightly, then gently massage the bag to distribute the marinade. Refrigerate for about 10 minutes or up to 2 hours for stronger flavour. Lightly grease with oil a skillet and heat to medium heat. Remove the salmon from the marinade, and reserve the marinade for later. Pat the salmon dry with kitchen paper, then season with za'atar and salt and pepper to taste. Sear the salmon, skin down, and cook over medium-low heat for about 5 mins, brushing the fish with the marinade as you cook. Discard leftover marinade. Turn the fish and cook a further 2 minutes, or until the salmon flakes easily with a fork. Serve immediately with your favorite salad on the side. For baked version: Place the skinless salmon fillet on a large square of foil, pour over the marinade, arrange a few orange slices over the sides and bake in a preheated oven to 180C/360F for about 5-7 minutes or until salmon flakes off with a fork. It tends to be sweet, but it’s kind of expected if you use honey 🙂 I found the soy sauce balances out the sweetness very nicely!